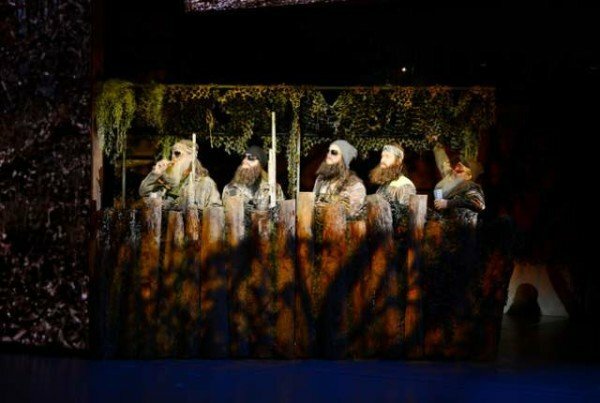 Duck Dynasty family members are bringing their story to life onstage for the first time with The Duck Commander Musical. Based on the best-selling book The Duck Commander Family by Willie and Korie Robertson, the show will make its world premiere at the Crown Theatre inside of the Rio All-Suite Las Vegas Hotel and Casino in April 2015. The Duck Commander Musical transports the Louisiana bayou to the Las Vegas stage in a captivating 90-minute show – seasoned with all the southern spirit and down-to-earth humor you expect from America’s most famous rednecks, the Robertson family. While the true-to-life, rags-to-riches story behind A&E’s Duck Dynasty will surely please its most loyal fans, audiences unfamiliar with the Robertsons will also find themselves charmed – and even moved – by this surprising tale of faith, food, and family. The show is suitable for ages 5 years old and up. This driving country-pop song features Korie Robertson teaching her husband Willie a lesson about staying true to himself. Miss Kay Robertson shows the young’uns how it’s done in the kitchen in this rocking country hoe-down. The opening song of the Duck Commander Musical lays it all out for you with a Southern rock heartbeat: these are the three pillars guiding the Robertsons’ everyday lives, and they all start with F ! In this sweeping ballad, Willie and Korie Robertson realize they have been destined to be together all along and that their future rests in the hands of a higher power.